Hanna woke me up at 3am this morning. No, Hanna is not my child; Hanna is a storm making its way up the East Coast. At 3am the rain was pouring down buckets. Big sheets of fat raindrops banging against the top of the air conditioner, smashing against the bedroom windows, pounding down on my roof. I tried to roll over, and just ignore it but I couldn’t. So I was up and on the couch where it was a little bit quieter. Last night we made sure everything in the yard was secure and tied or bolted down. By tonight we should have some really strong winds and lots of rain. My garage will flood. My basement will flood. We know this for a fact and are prepared with pumps at the ready. Everything is moved up off the floor and every yard ornament is nestled in my shed. Not fun. By 7am I had a brisket in the crock-pot. There will be no cooking the meat in the smoker today. With the possibility that we will lose power I thought I’d better whip up a few goodies while I still had electricity. 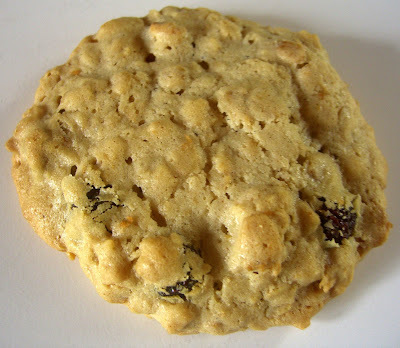 I went blog searching for some chewy oatmeal raisin cookies. They are John’s favorites. I came across Andrea's Recipes. Her recipe looked really good. It was adapted from an America’s Test Kitchen recipe. I know BOO, HISS! The ATK people haven’t been very gracious with bloggers posting their recipe so I decided, what the heck….I’m posting Andrea’s version, which is no longer an ATK recipe, so there Mr. Bow Tie. Sue me. In a medium bowl whisk together the flour, baking powder, salt and nutmeg/cinnamon. In the bowl of a stand mixer, mix together the butter and sugars on medium speed until it’s light and fluffy (about 5 minutes). Add the eggs one at a time, mixing 30 seconds after each one. Slowly add the flour mixture on low speed and mix until just combined. Stir in oats and raisins gently until just combined. Make sure the oats are even distributed throughout the dough; otherwise you will have clumps of oats. Phooey! Scoop a ball of dough and roll it in your hands, then drop it on a baking sheet 2 inches apart. I covered mine with parchment. Dampen your fingers with water and lightly press down on the top of each dough ball to flatten it slightly. Bake for 22 to 25 minutes. The cookies should be golden on the edges, but the center should be soft and puffy. Allow cookies to cool on pan 10 minutes before moving them to a wire rack to cool. this post is reminding me how badly i want a homemade cookie! looks delish. stay safe... and i haven't made oatmeal raisin cookie in forever... maybe when it cools off i'll make them sometime soon. it's 101 degrees today so no oven! 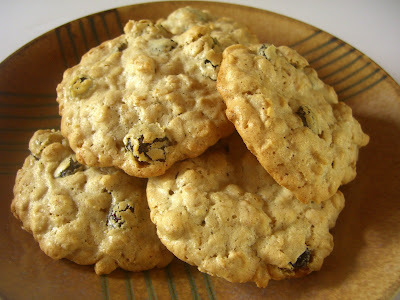 Lisa, I may be making these soon...and adding one of my own twists for oatmeal cookies. I like to roll the balls of dough in cinnamon sugar (like you would for snickerdoodles) before putting them on the baking sheet. Mmmmm. Maybe I would just use the nutmeg in the recipe and then add the cinnamon sugar. ps. I'm thinking tomorrow I'll leave the butter out to get soft. Mmmmmmm. Lee that sounds like a great idea. I have to remember that one. Hope you are safe. I am amazed at how many bloggers in the face of hurricanes still cook (and bake). A lot of baking going on with a natural disaster. At least you can enjoy a good cookie! Lisa, I made your cookies today... well, they were sorta your cookies. Yet another change to the recipe. I only had dark brown sugar and I used dark chocolate chips and pecans instead of the raisins. I used the nutmeg in the batter and skipped the cinnamon sugar finish. Everyone at my pottery class loved them and sends their thanks!